The silver lining for Democrats in the GOP tax bill. Democrats should seize an opportunity in the Republican tax reform bill. 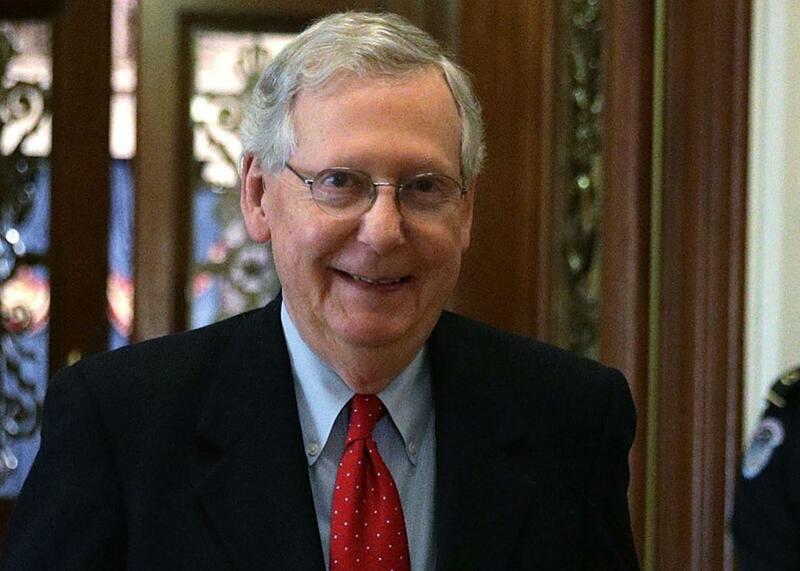 Senate Majority Leader Sen. Mitch McConnell walks from the Senate chamber to his office on Friday in Washington. Late Friday night, Senate Republicans passed a hastily crafted $1.5 trillion overhaul of the tax code on a party line vote of 51–49. Only Bob Corker of Tennessee broke ranks to vote against the bill, whose final draft was introduced hours before voting with handwritten amendments scribbled in the margins by lobbyists. This plan, centered on a large corporate and upper-income tax cut, has clear winners and losers, with most of the American public falling in the latter category. “It’s hard to imagine a more egregious waste of time and energy, or a worse outcome for taxpayers and the broader economy,” concludes a scathing editorial from Bloomberg View. No amount of opposition from Democrats (nor the public) could keep Republicans from passing the bill. Still, there is something of a silver lining for Democrats in this defeat, one that matters greatly in the inevitable fight to roll back or repeal these tax cuts. First, the winners: Big businesses and their investors receive hundreds of billions in new tax breaks and deductions, growing profits and putting more money in the hands of wealthy individuals. Lower rates for “pass-through” businesses, owned mostly by the rich, give even more cash to the nation’s wealthy elite. And when those elites eventually die, they’ll have an easier time passing on their fortune: The Senate plan allows rich parents to pass the first $11 million of a fortune to children tax-free, while the House plan eliminates the estate tax entirely. House Speaker Paul Ryan claimed to want a “middle-class tax cut” and “a system that’s more fair, much simpler.” That is not what’s on the table. Under the Republican plan, Americans in the middle receive modest tax cuts ranging from a few hundred dollars for those in the 40th percentile of income to $1,430 for those in the 80th percentile. The vast majority of benefits go to the highest income earners. The top 1 percent receive an average cut of $34,130. The top 0.1 percent get a cut of $85,640. And while the middle-class tax cuts are temporary, the rate reductions that give benefits to high-earners are not. The effect, in 10 years, is a middle-class tax hike. By 2027, those in the middle quintile—making $40,000 to $50,000—would pay a combined $5.3 billion more in taxes, while those earning more than $1 million would pay $5.8 billion less. Overall, the richest 20 percent of households will reap 90 percent of the benefits of the Republican proposals. This gets to the losers of the tax bill. The Senate plan includes a repeal of the individual mandate that requires all Americans to purchase health insurance. This is the “skinny” repeal of the Affordable Care Act that was rejected over the summer. If it becomes law, the Congressional Budget Office expects 13 million Americans to drop health insurance over the next decade. And while lower-income families escape direct impact, Republicans are already planning to reduce the debt from their tax cuts by slashing retirement programs and spending on the poor. As recently as last Wednesday, President Trump said that the GOP tax plan would “cost him a fortune.” These were lies. The truth is that Trump and his family will reap enormous benefits from this bill, saving billions of dollars and growing their fortunes on the backs of ordinary taxpayers. Republican tax reform is just another way in which the party ran a scam in the 2016 election, promising one set of policies to voters then delivering just the opposite once in office. It’s a smash and grab of public funds for private gain. Democrats, it should be said, did real damage to this effort. Major tax cuts are usually popular, but the Republican tax plan is starkly unpopular, with just 32 percent of Americans in approval according to an analysis by FiveThirtyEight. This make the Republicans’ ostensible tax cuts more unpopular than even some tax hikes. Part of this is polarization among voters, but part of it is the unified opposition and consistent messaging of House and Senate Democrats, with conservatives like Joe Manchin of West Virginia and Heidi Heitkamp of North Dakota standing shoulder to shoulder with left-wing figures like Bernie Sanders and Elizabeth Warren. Democrats couldn’t stop the bill, because the GOP was so committed to passing it. Upper-income tax cuts are the raison d’etre of the modern Republican Party. The prospect of passing a bill like this is precisely why Paul Ryan and Mitch McConnell stuck with Donald Trump through the campaign, tolerating his racism and misogyny, looking past his history of fraud and sexual assault. It’s why, in the first year of his presidency, Republicans have kept their heads down, backing Trump despite his corruption, racist demagoguery, and dangerously unhinged rhetoric. But the process that produced this bill opens an opportunity for Democrats, should they choose to take it. Republicans have shown that, if you have the will, you can pursue broad and expansive policies without buy-in from the other side. And with this particular bill, they’ve passed a set of difficult tax increases—eliminating the deduction for state and local taxes, for instance—that can be used to fund future programs for the poor and middle-class. If Democrats can regain power in 2018 and 2020, the path is clear for a simple set of changes: Repeal the Trump tax cuts, and use the revenue to expand Medicare, strengthen Social Security, and revitalize the social safety net. Republicans have finally delivered for their donors. Democrats have a way to make them pay for it.